Sr Paul is a semi-retired Sister living in Springfield, South Africa and does various ministries, including being the spiritual director of the Lay Dominicans in Cape Town and using her giftedness as a Sacristan in the Convent Chapel in Springfield. I was born in Matjieskloof, South Africa in 1935. My family and I later moved to Matroosfontein, where I attended Holy Trinity, a Dominican School, until I was fourteen. Whilst there, I got to know the Dominican Sisters and joined the Children of Mary Sodality. I was drawn to the Dominican way of life, and spoke to Mother Catherine Dixon, the Spiritual Director of the Children of Mary Sodality, about joining the Convent. Mother Catherine advised me to pray about it, and in 1953, I made up my mind to join the Dominican Sisters. The person who inspired me most was my mother who taught me about the faith and moral values. She often spoke about the Sisters she had known when she lived in an orphanage and assured me that I was making the right decision to follow God’s Call and become a Dominican Sister. 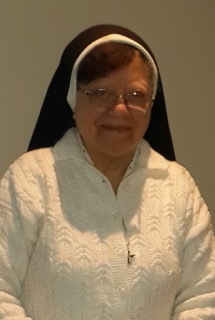 I have now been a Cabra Dominican Sister for over 50 years and although I admit that it was sometimes tough, I also remember highlights of my life in the Convent. I enjoyed the experience of living with different cultures, for example, the Irish culture and my own Coloured culture. I also loved teaching in Kirkwood and spending time with the people there whom I describe as “simple and lovely”. I live a life committed to learning and teaching, prayer and preaching the Word of God, not only by speaking but also by my actions, and helping and encouraging the growth of my community. Besides all my usual duties as a Dominican Sister, I taught at St Reginald’s, Kirkwood, for 10 years. I also did supervision in the Boarding School after school and on the weekends, as well as attending Out-stations for Mass on Sundays, where I met many people and children. The Dominican ideal that has been around for centuries and that so inspired my life is still very relevant for us today. Whether we are Christian or not, the search for Truth in all things is an ideal that we should all learn to live by, as it can make us happier and better people, and the world a happier and better place.